Insulations have been defined as the materials used to retard the passage of heat. Since heat flow is always from the warm side to the cold side and since the cost of heating buildings in our northern latitudes is quite high, insulation, if properly used, can conserve heat within the building during cold weather, reduce the transfer of heat to the interior of the building during warm weather, and eliminate the problems caused by condensation. Still air is the best known and the cheapest thermal insulator and is used to advantage in the manufacture of insulating products, either by trapping it in a closed cell within the insulating material, or as an air film around each small particle or fibre, which, combined with the multitude of other small particles or fibres, comprise an insulating material. In a roofing system we think of insulation as a structural type of board. There are numerous types of insulation available such as fibreboard, cellular glass, mineral board, plastic foam, high density glass mats, etc. Every type is good, but each has strengths and weaknesses that should determine its usage. Insulation should be chosen with the following properties in mind and matched to the type of deck being used: its dimensional stability, thermal expansion, thermal conductivity, compressive strength, water absorption, incombustibility and joint treatment. It should also be resistant to attack by and compatible with the materials used in the vapour barrier and built-up roof. Although all insulations meet some of these requirements to varying degrees, no one type meets them all perfectly. It therefore becomes the conditions of the specified application that determine which type will perform most satisfactorily. Roof insulation panels should be strong enough to resist crushing or compression by the traffic of the roofing crew and the equipment that they use. On steel decks, the insulation thickness should be rigid enough to bridge the flutes under construction conditions. In all cases, though, the insulation thickness chosen should be sufficient to ensure that the dew point is within the insulation, under the most severe conditions. Since condensation will occur at the dew point, an adequate vapour barrier should be installed, regardless of the type of insulation used, on the warm side of the insulation to keep the moisture in the air from reaching the dew point. This will ensure that condensation will not occur in either the interior of the building or in the insulation. 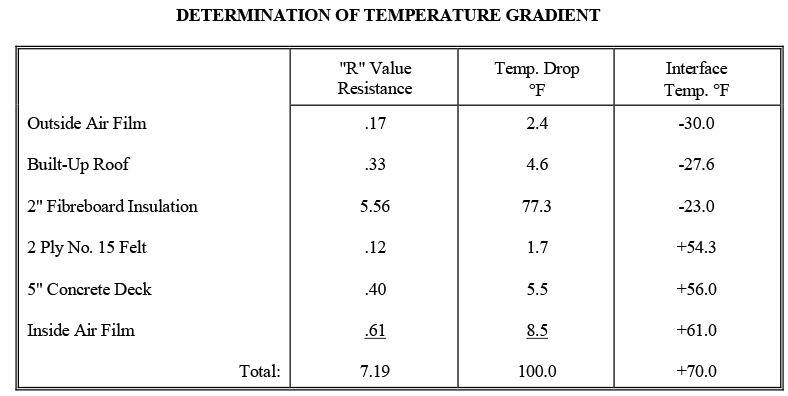 In the May and August 1969 Technical Bulletins, we explained, among other things, the resistance values of materials and the dew point temperatures and how they are determined. We should now look at the thermal gradient of a roofing system and see exactly how we can determine where the dew point will be under set conditions. Determine where the dew point will occur in a roofing system comprised of 5″ sand and gravel concrete deck; 2-ply No. 15 felt vapour barrier; 2″ of fibreboard insulation, and a 4-ply built-up roof. The inside temperature is 70°F and the relative humidity 40%. The outside temperature is -30°F. Note: For outside temperature always use the severest conditions that could occur. Using Figure 2 in our August 1969 bulletin we find that, under the conditions mentioned above, i.e. 70°F and 40% relative humidity, our dew point temperature is 45°F. Our dew point temperature will therefore be at a point .24″ in from the warm side of the insulation. If it is below the insulation, then additional insulation must be added to the system. As you can see from the above example, it is a simple matter to determine the dew point line and thickness of insulation required for the severest of climatic conditions. If, at the same time, the type of insulation giving the best properties for the deck, roofing and job conditions, is chosen, a greater degree of success and longer life for the roof is assured.